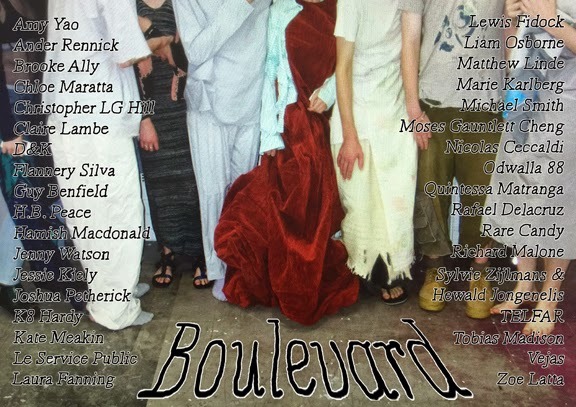 Gertrude Contemporary is pleased to present Boulevard, a three-day, multi-disciplinary project by Centre for Style comprising an exhibition, performance art, poetry readings, music, and fashion events. Each of the artworks, acts, poems and performances considers how bodies move through space, such as down a street or boulevard. The multiple components of Boulevard work together to articulate the expanded field in which contemporary fashion circulates. Featuring: Amy Yao, Ander Rennick, Brooke Ally, Bum Creek, Chloe Maratta, Christopher LG Hill, Claire Lambe, D&K, Flannery Silva, Guy Benfield, H.B. Peace, Hamish Macdonald, Jessie Kiely, Joshua Petherick, K8 Hardy, Kate Meakin, Le Service Public, Laura Fanning, Lewis Fidock, Liam Osborne, Matthew Linde, Marie Karlberg, Michael Smith, Moses Gauntlett Cheng, Nicolas Ceccaldi, Odwalla 88, Quintessa Matranga, Rafael Delacruz, Rare Candy, Richard Malone, Sylvie Zijlmans and Hewald Jongenelis, TELFAR, Tobias Madison, Vejas, and Zoe Latta. Centre for Style is an exhibition space and store for contemporary fashion practice directed by Matthew Linde. Commenced in July 2013, the Centre has showcased the work of designers, artists and writers from across the world through performances, runways, exhibitions, publications and as a retail store. Centre for Style has recently curated shows at Mission Comics (San Francisco), Mathew (Berlin) and Utopian Slumps (Melbourne). Tobias Madison is represented by Galerie Francesca Pia, Zürich.